By admin | February 17, 2015. Traffic along the Dublin 8 quays was temporarily disrupted this morning following an accident on Bridgefoot Street. 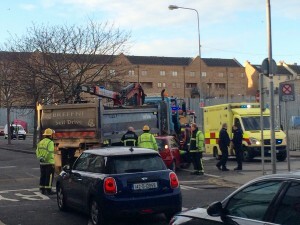 Members of An Garda Síochána, together with units of Dublin Fire Brigade, quickly arrived on the scene of the incident, which occurred at approximately 8.15am at the junction of Bridgefoot Street and Island Street in Dublin’s Liberties area. A construction truck was turning right onto Island Street from Bridgefoot Street when it collided with a car. The driver of the truck escaped injury while the driver of the car was treated at the scene for minor injuries and shock. Vehicular access to the area was restored within half an hour.